The Chinese garden is intended to be an imitation of nature, and as such should fully manifest the beauty of nature in a limited space. Many of us are aware of the northern imperial gardens, that were built primarily in the Ming (1368-1644) and Qing (1616-1911) dynasties. These gardens were places where feudal royalty could live, walk, entertain and hunt. They spanned vast areas, and required considerable financial investments and human recources. 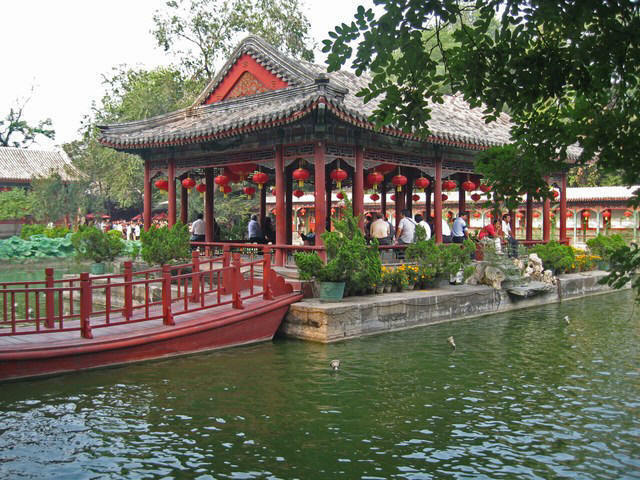 The gardens of Southern China are concentrated in cities and towns on the lower reaches of the Yangtze River. These gardens were renowned for their delicate beauty, and as such were favoured by scolars and calligraphers as places where they could work and live close to nature. They also provided a social setting where visitors could stroll, exercise, talk, meet with friends, and where the men could play games and discuss events of the day. Another kind of garden were those, built around Buddhist and Taoist temples. In summary - hunting, and communion with spirits and nature were the primary focus of the earliest Chinese gardens. One garden which significantly influenced the art of garden construction was the Shanglin Yuan (Upper Woods Garden) of the Han Dynasty. The power of the Han Dynasty and its garden construction both reached their peak during the reign of the emperor Han Wu (140 BC-87 BC). The Shanglin Yuan garden was surrounded by a wall of approximately 150 kilometers in length. 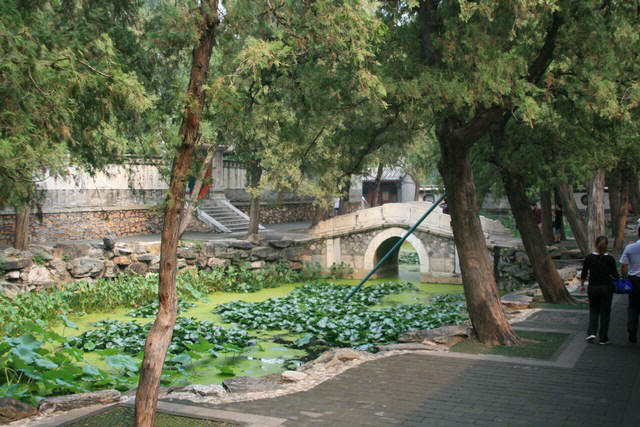 The eight largest rivers of central Shaanxi all run through the garden. Shanglin Yuan garden is testiment to the ability of these people to build gardens on an almost unimaginable scale. In order to gain an appreciation of the scope of this undertaking, witness the fact that the Kunming Pond alone, one of the divisions within this vast complex, covered an area of some 150 hectares itself. There were clusters of buildings, parks, corridors, bridges and pavilions. To symbolize a large country, the palaces and parks of the Han Dynasty strived to manifest heaven, earth and the universe in their design. 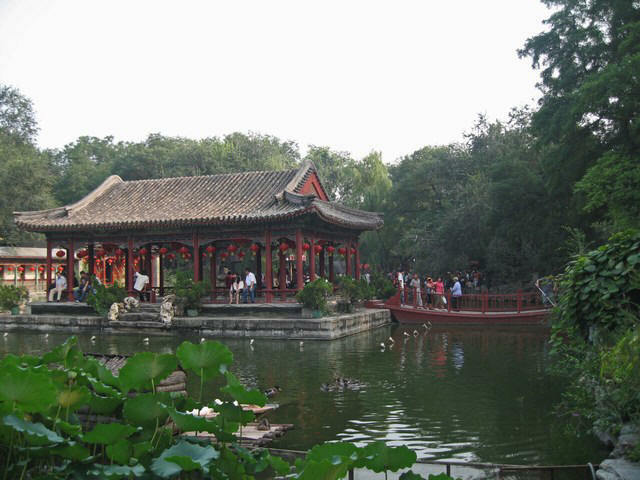 In the Taiye Pond of the Shanglin Yuan Garden three islands were built. 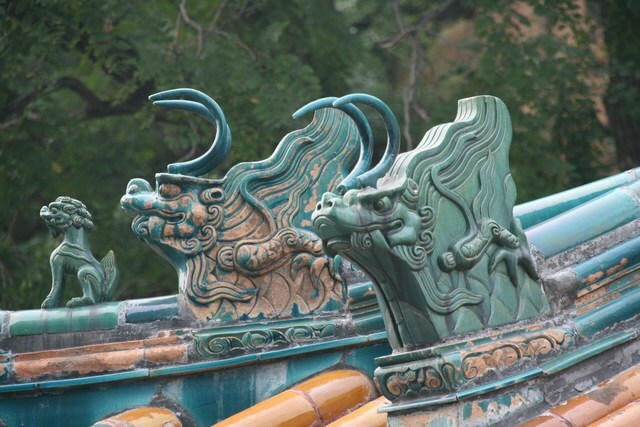 These signified the three sacred mountains which can be found in folk tales. This practise of 'three mountains in a pond' was to become a tradition to builders of gardens in later times. After a period of waring, in 67 A.D. Buddhism was introduced in China. It had a profound influence on the thinking of the time. Both Buddhism and Taoism were conducive to walking in nature. Reverence for nature permeated the entire society, and was even seen in the aspirations of common people who, in their own private gardens tried to create idyllic pastoral atmospheres. The plants most commonly used were pine, fir and bamboo. These were selected, primarily because they are green all year round. In addition they are tall and straight, two characteristics their owners wished to emulate. Simultaneous with the development of the art of garden building during this period was the flourishing of poetry and literature, calligraphy, painting and music. 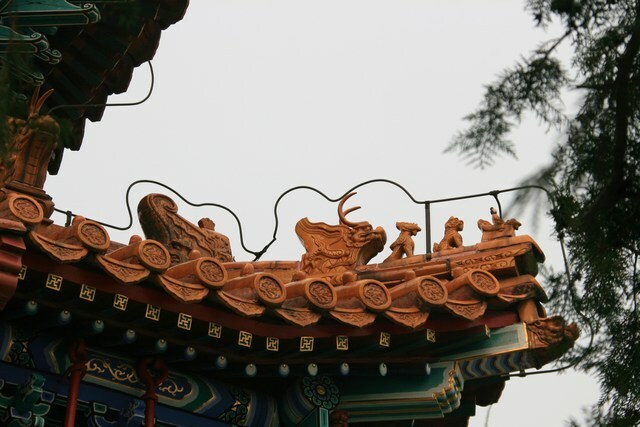 Together with the building of Buddhist and Taoist temples all over China was the emergence of many temple gardens, which gradually merged together with the imperial gardens and privately-owned gardens. During the period of the Tang Dynasty (618-908 AD) the economy flourished and China became more prosperous than ever before. 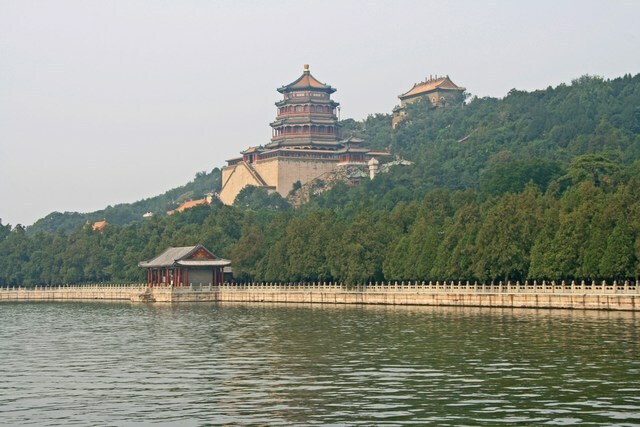 The imperial gardens were located mainly in and near the capital Chang'an. 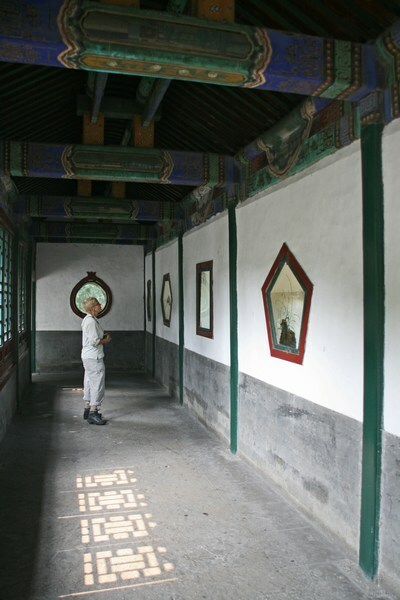 The largest of these gardens was Jin Yuan, the Forbidden Garden. Inside this garden there were 24 smaller gardens. 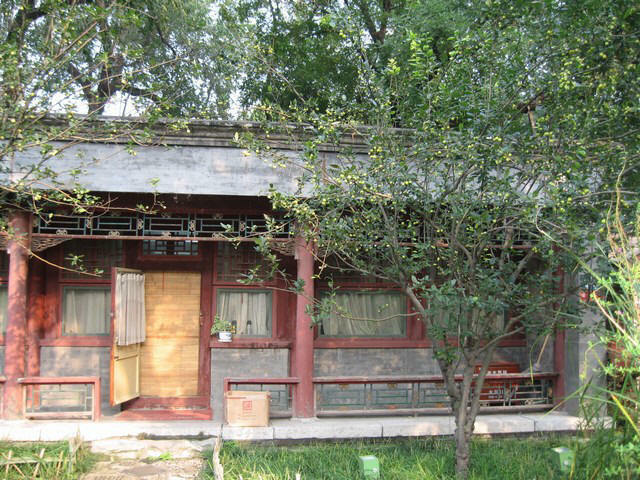 Jin Yuan was the place, where royalty would go to enjoy nature. Every year the emperor would visit this place with the empress, his concubines, and entourage, to hunt, feast, sing, dance, and play games. Polo was especially popular among the Tang Dynasty emperors. 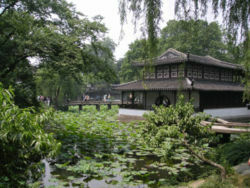 The palace gardens of the Tang Dynasty had 'three inners' ( a combination of palaces and gardens) and 'three gardens'. During this period the palace area was usually located in the front, with the garden in the rear. This became the basic layout of royal palaces in future. It is noteworthy that the flourishing of culture and art during the Tang Dynasty created circumstances, very favourable to the development of private gardens. Poetry, and paintings illustrating nature, played an important part in the design and presentation of gardens built during this period. 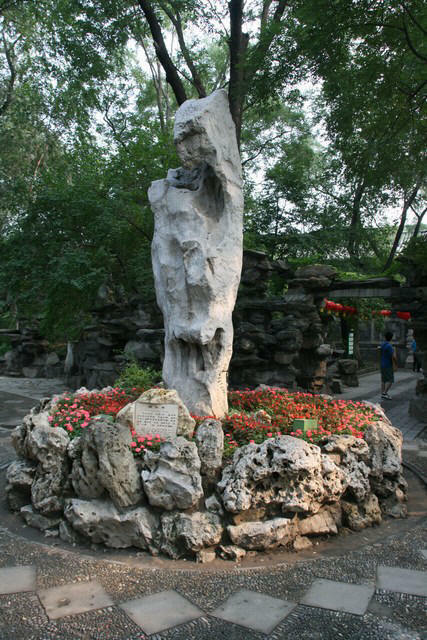 One of the famous examples is the garden of the famous poet and painter Wang Wei. He not only built a beautiful garden in a natural valley with hills, forests and lakes. He was also inspired by his own creation, and wrote many of his better-known poems about this scenic spot. Where the Eastern wilds stretch far without hills. The river glistens through the villages. Hunting dogs return following their men. When a man's at peace, what business does he have? I shut fast my rustic door throughout the day. Gardens built by poets reflected their general philosophy of life. Their style was clear, simple and elegant, as compared with the extravagance and luxury of the imperial gardens. These gardens provided guidelines to which ones built in later times would adhere. 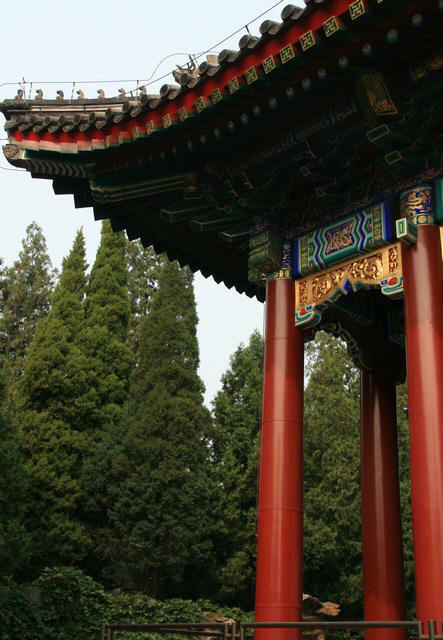 Garden building evolved to even greater heights during the Song Dynasty (960 - 1279). Even teahouses and pubs in cities built gardens with ponds and rockery. Gardens of the intelligentsia of this time occupied much less space than in previous times; but in the relatively small courtyards one could find a wide variety of the artifacts typically associated with gardens, i.e. brooks, hills, springs, ponds, islets, trees, flowers, rocks, pavilions and halls. The privately owned gardens of the Song Period, including large numbers of those belonging to officials, eunuchs and men of letters, were largely concentrated in Kaifeng, Louyang, Suzhou and Hangzhou. These gardens were the most representative of this period. 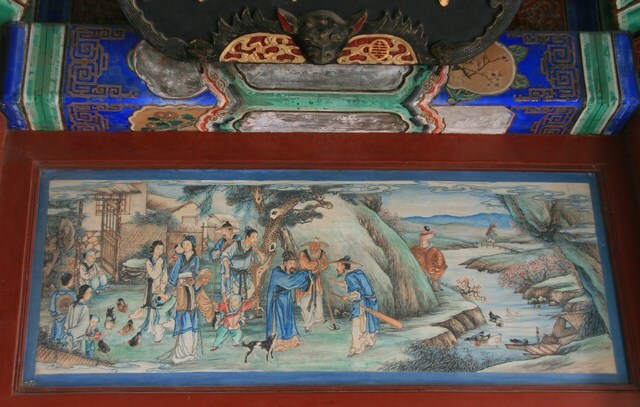 The small garden art pieces of this time, such as scrolls with couplets, horizontally inscribed plaques, stone foundations and paving with inlaid patterns surpassed the previous periods in their richness and diversity. This period, which lasted over three hundred years, was the period of maturing in the development of China's classical garden. During this period a book was written about the ancient architectural design. Private Gardens of Ming and Qing Dynasties. 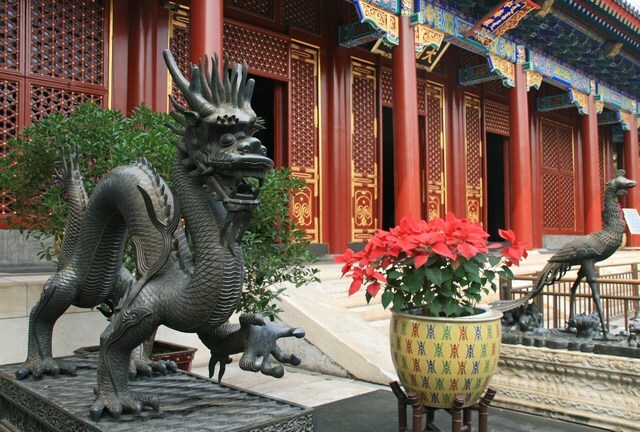 The private gardens of Ming and Qing Dynasties are mainly situated south of the Yangtze River and in Beijing. Some of these gardens, for example the Lion Forests and the Lingering Garden have been listed as the World Cultural Heritage by UNESCO. Private gardens of the South. The spread of private gardens in the south was due to many factors. One was the abundance of rivers and lakes, which provided ample water. Also, high humidity and the lack of severely cold weather, are ideal conditions for evergreens. And of course, rocks and stone are plentiful, items without which no Chinese garden would be complete. In the Ming and Qing Dynasties, government officials were selected through the imperial examination system, and many were selected from the south and sent to Beijing. Upon retirement these scholars and officials would return to their hometown. Here they purchased land and built gardens. Private Gardens of the North. The northern region is quite different from the south in terms of natural conditions, economic development and culture. As the north is low in temperature in winter times, vegetation is rarely evergreen. In Spring and Summer, there is no such a variety of flowers as in the south. Also, the northern economy was not as developed as that of the south. However, most dynasties have set up their political centre in the north, especially Beijing. 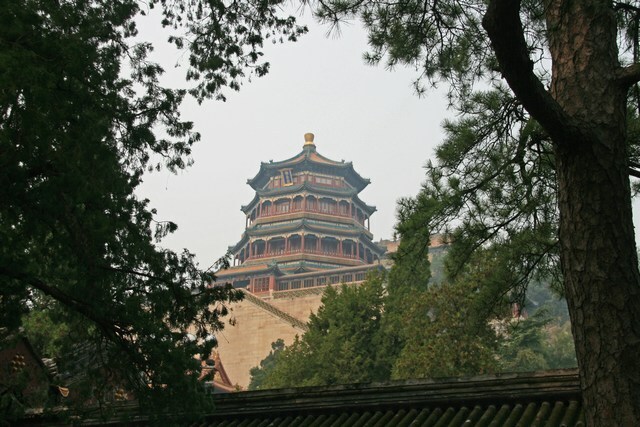 As the capital city of the Yuan, Ming and Qing Dynasties, Beijing housed large numbers of royalty and aristocrats, who had the political power and economic privilege to do what they wished. This resulted in a large number of gardens being built in the north, despite the less advantageous growing conditions. 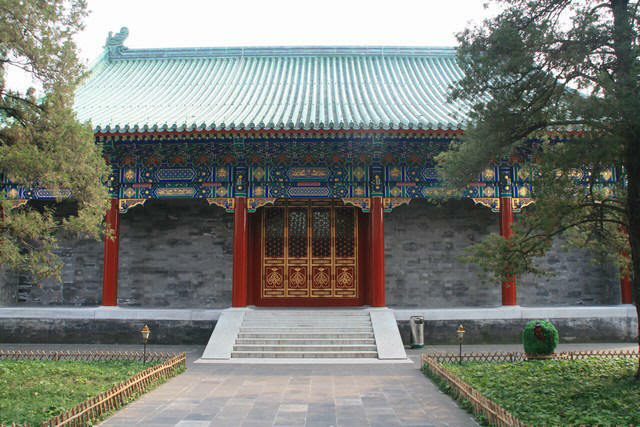 In addition to gardens of the officials, rich merchants and intellectuals, there is another type of private garden in Beijing, the garden within the palaces of princes. 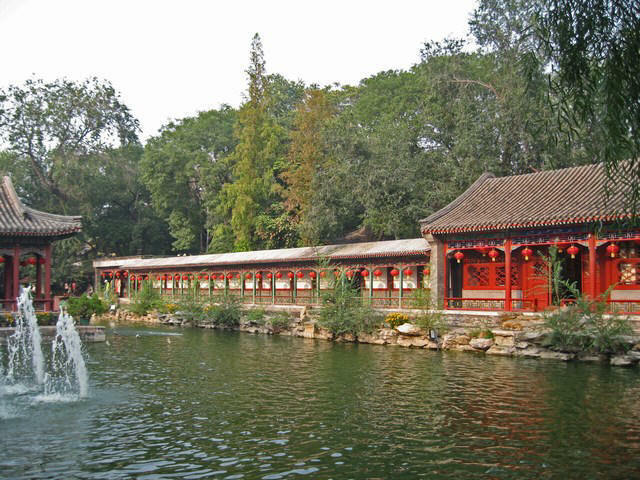 The largest and best preserved among these is The Prince Gong Palace Garden. Of the many others of this type, it is the only one open to the public. Built in 1776 (the 41st year of Qianlong), Prince Gong’s Mansion is the best preserved of all existent Chinese princes’ mansions. It was home to two famous and powerful men. One was imperial Academician He Shen, the Qianlong Emperor’s favorite minister, and the other was Yixin, or Prince Gong, one of the Tongzhi Emperor’s chief advisors. The mansion was named after the latter. The mansion consists of houses and a garden, covering an area of some 60,000 square meters – 32,000 for the houses and 28,000 for the garden. It was made a State Protected Historic Site in 1982. The mansion has five rows of courtyards in three columns, which contain well-built and imposing structures. The green glazed tiles on the roofs of the houses in the middle column indicate an architectural grade only next to the imperial palace. The garden is named Cuijin Garden, or Garden of Various Beauty. Surrounded by hills on three sides, it contains more than forty views and scenic spots that are divided into three columns in the east, middle and west. For visitors it’s sheer delight to wander in the Garden among the green hills and gurgling steams. 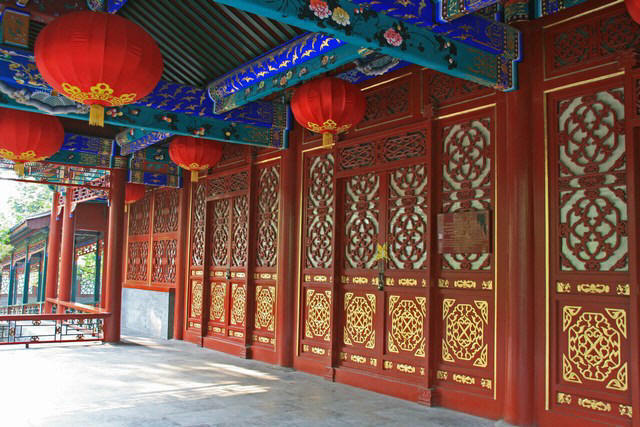 The houses and garden of Prince Gong’s Mansion, which are said to reflect half the history of the Qing Dynasty, embody the rich and splendid culture of Qing princes’mansions. 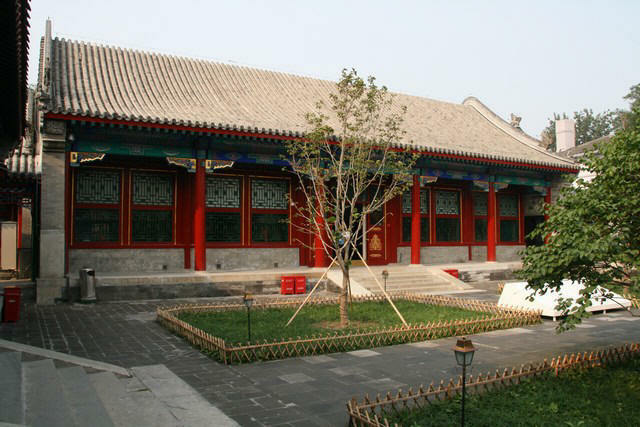 The Prince Gong Palace can be divided into two main areas, the residence and the garden, the former being in the front, and the garden in the back. The garden occupies 28 thousand square meters, and includes 31 historic buildings. 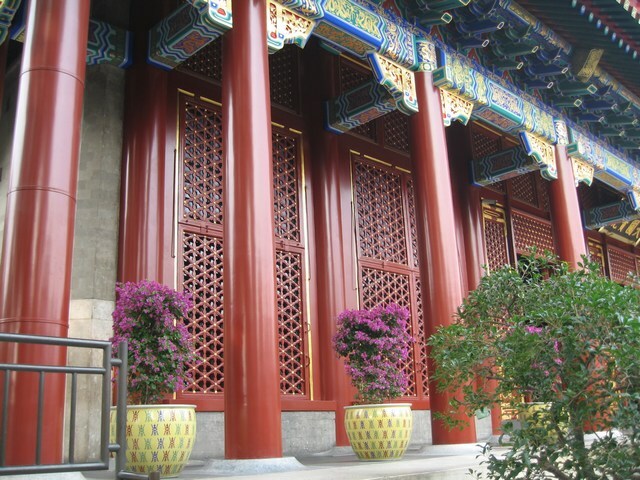 The subsequent owner of the garden summoned hundreds of the best craftsmen to reconstruct the garden, combining both southern garden style and northern architectural layout, and incorporating both Western and Chinese architectural elements. The whole garden is laid out in three routes. 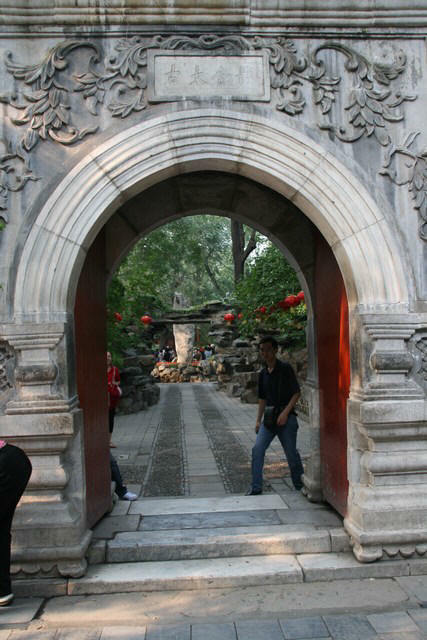 Entering the garden through the central gate, one first sees a door of white marble. Facing the gate is the five meter high Dule Peak, shaped like clouds rolling back and forth. Behing the Dule Peak there is Anshan Hall, sitting on a base of stone and connected to the eastern and western wing rooms by corridors to form a three-sided courtyard opening to the south. 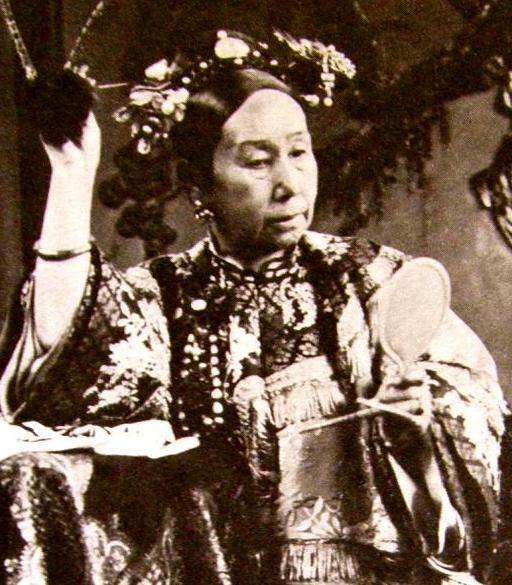 In Qing Dynasty Beijing, the channeling of running water into a private residence would have required the emperor's consent, an honor rarely bestowed, except for a few princely palaces. Among those honoured was the Prince Gong Palace. Within the garden there is a large batshaped pond built with green stone named the "Bat Pond". Elm trees encircle this pond, and in the season when the elm seeds fall, the coin-shaped seeds cover the Bat Pond, implying "wealth and fortune (bat is homonymous with fortune in Chinese)". Crossing the hall to enter the central courtyard, one can find a stone hill called "Rock of Dripping Green", the major scene of the entire garden. 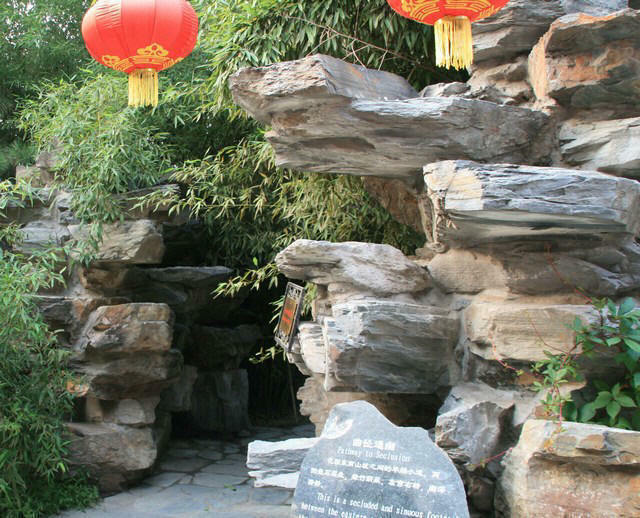 In front of the hill there is a small pond, and behind the pond there is a cave called "Cave of Secret Cloud", inside which there is a stone tablet with the word "fortune" which is said to have been inscribed by Emperor Qianlong. At the north of the Rock of Dripping Green is the Bat Hall. 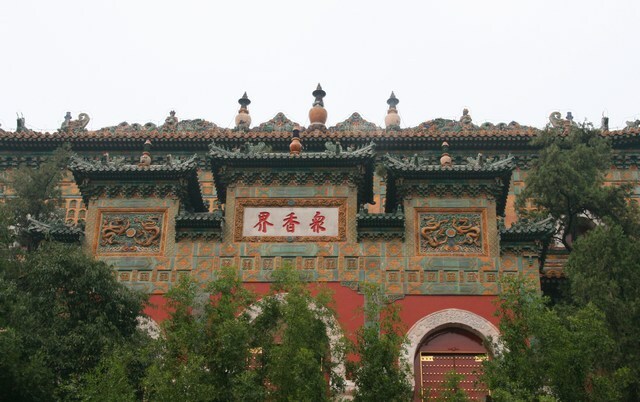 Main constructions such as the garden gate, the Anshan Hall, the Rock of Dripping Green and the Bat Hall are all located at the central axis of the Prince Gong Palace residential area, and as such form a standardized central core. 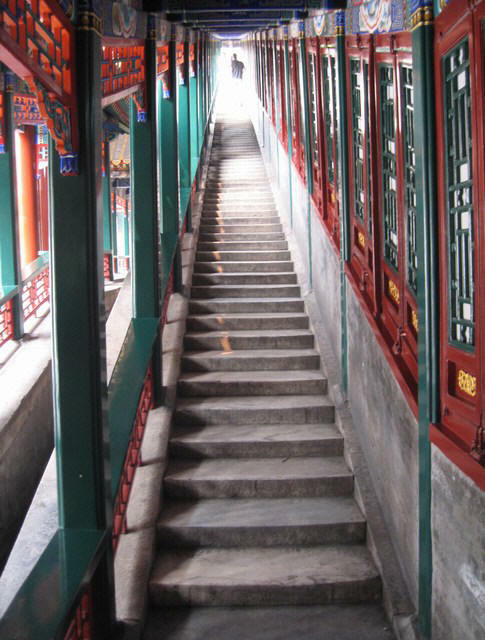 The east route of the Garden of Gathered Brocade is made up of dense architectural groups. 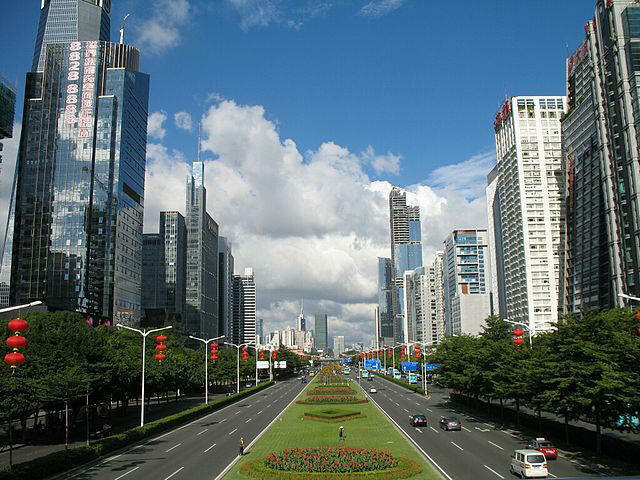 The southern part is composed of two parallel-running long and narrow Siheyuan Courtyards. The northern part is the grand opera stage, a large architectural structure including the front hall, the grand hall for watching the opera, the stage and the backstage. On the eastern route and in the courtyard with decorated doors, the most elegant architecture is the "Refreshing Autumn Pavilion" or the "Running Wine Cup Pavilion", containing a twisting, turning creek, 10 centimeters wide, shaped in the likeness of the Chinese character "pavilion". There is very little architecture on the western route. This area is comprised mostly of mountain scenery and water climes. Scattered within this garden are the Lake-center Pavilion, Cloud Washing Residence and Firewood Fragrance Path. 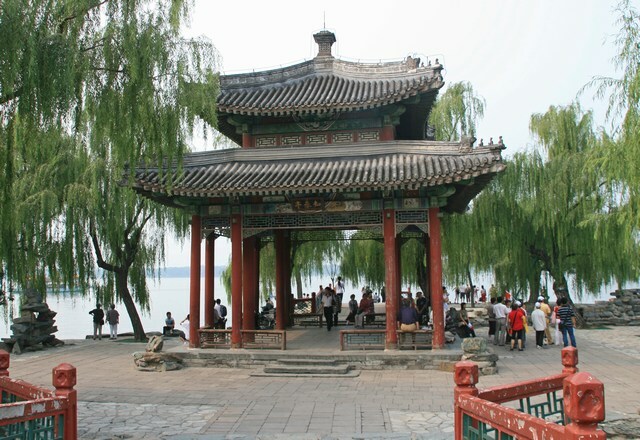 Within the Lake-center Pavilion are three water pavilions, named "Stoan Boat of Poetry and Paintings". 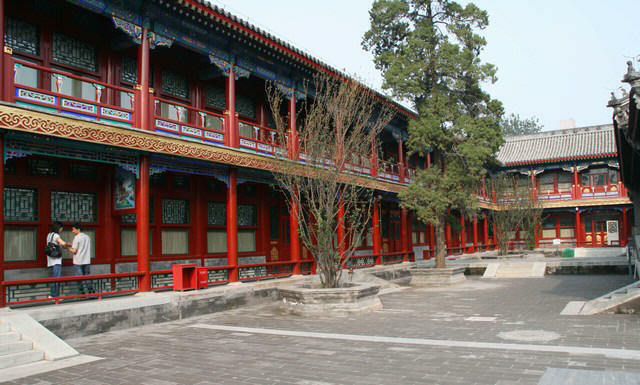 The Garden of Gathered Brocade, being a prince palace, has a larger number of architecture and is a more formally laid-out courtyard compared with private gardens of scholars. Considerable care has been taken to ensure that the overall environment is well planned. Fpr example - at the entrance to the garden gate, artificial hills are built on both sides with green stone, flowers and trees planted on the hills. Paths on the hills extend to the east and the west, passing through hill after hill. In addition, earthen hills have been constructed on the outer perimeters of the eastern and western routes, essentially isolating this garden from noise and outside influences. Also, local treatment of mountain and woods is emphasized. Within the more formally laid-out courtyards on the central and eastern route, irregular-shaped ponds, mountains and rocks are used in addition to the lush bamboo, ancient pines, ancient Chinese locusts and other trees, bushes and flowers. This method effectively disguises the inherent rigidity of such a formally-planned and layout environment, leaving the visitor with a sense of natural harmony. In all, the western route has been designed to reflect nature's beauty, replete with trees, water, and hills, in a simple environment. 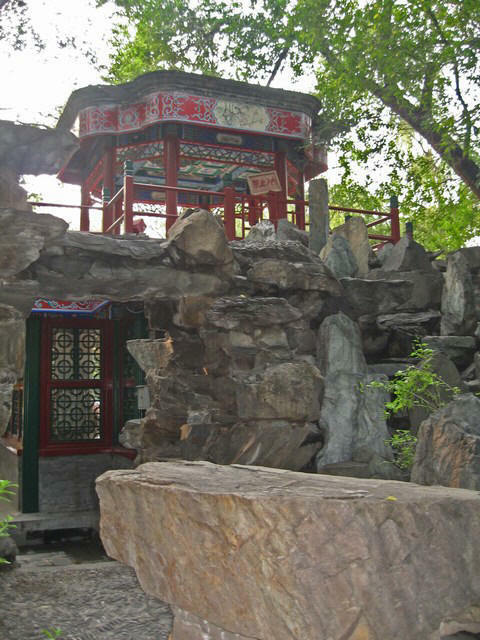 The last picture above is of a secluded and sinuous footpath, connecting the eastern and southern slopes of the Prince Gong Garden, and is flanked by rocks and bamboos. Private gardens, regardless of whether they're from the north or the south, whether built by scholars, officials, aristocrats or rich merchants, all have one thing in common: they all try to create an environment close to nature, in an area of limited space. The building of classical private gardens all exhibit the following common characteristics and guiding principles, which have been passed down through generations. 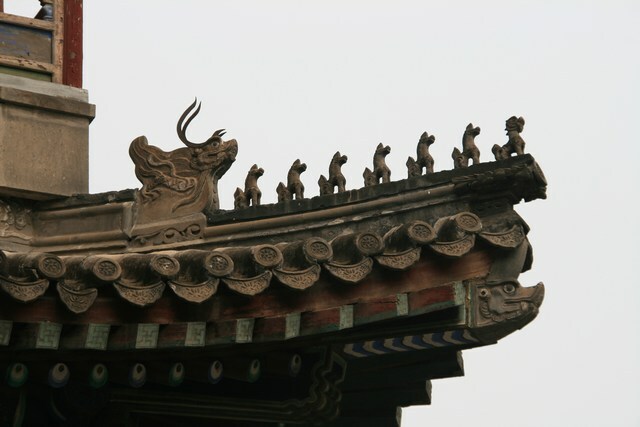 Classic Chinese architecture is mostly simple in shape and not large in volume. Judging by the documentation of ancient times, and existing gardens, one comes to the conclusion that this layout of classic Chinese architecture consists of a courtyard with single buildings on all sides. The main building is situated in the center, and is flanked by secondary buildings on either side, thus forming a layout with a central axis. This is the beginning structure, or concept, which is then altered to create an environment that emulates nature. Like all other kinds of architecture, architecture in gardens has to fulfill functional demands. The owners of private gardens have several needs. They like to use their gardens for reading, walking, entertaining, etc. These criteria have consequences for the architecture of these gardens. The reading area should be quiet, the entertaining area convenient and the walking area should embody the mood of nature and natural landscapes. In addition, the garden must possess beauty. It has to be an environment that reflects that beauty nature. Architecture in a garden environment does not exist in isolation, but rather forms a comprehensive scene together with nearby mountains, waters and vegetation. In the Humble Administrator's Garden in Suzhou, which is considered the finest garden in southern China, the Fragrant Snow and Clouds Pavilion is not an isolated pavilion - it sits on the islet mountain at the center of the pond, is set off by flowers and plants on all sides, supported by rock hills from the bottom and surrounded by a pond full of lotus flowers in summer time. 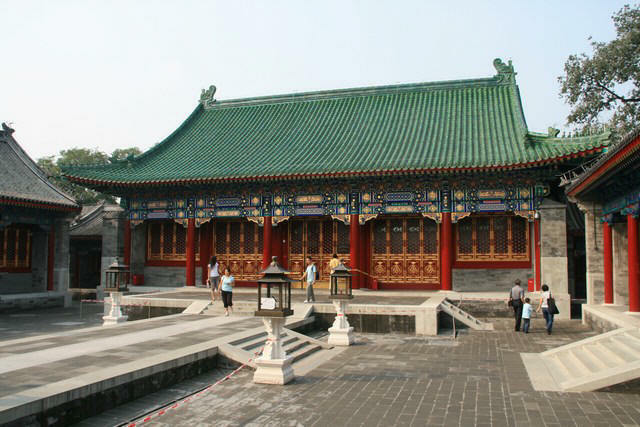 Another example is the Garden of the master of the Nets, designed during the Song Dynasty (960 - 1279). 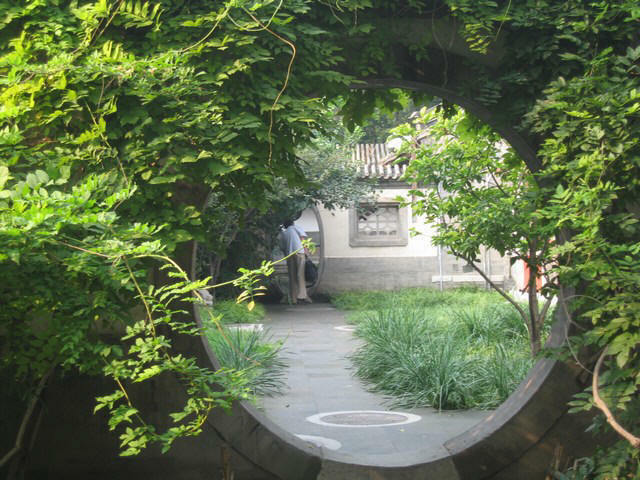 It is the smallest of the Suzhou residential gardens, but it's impressive, because of its use of space, which creates the illusion of an area that is much greater than its actual size. On the east bank of the pond in the Master of Nets Garden, the Duck Shooting Corridor. To the south are the rock hills and the year round colourful vegetation along the corridor and among the rocks and stones, form a colorful painting agaginst the backdrop of white-washed walls. Hills, water and architecture form scenic spots, and multiple scenic spots form scenic areas. Scenic spots and scenic areas work in synergy to create a garden of great beauty. 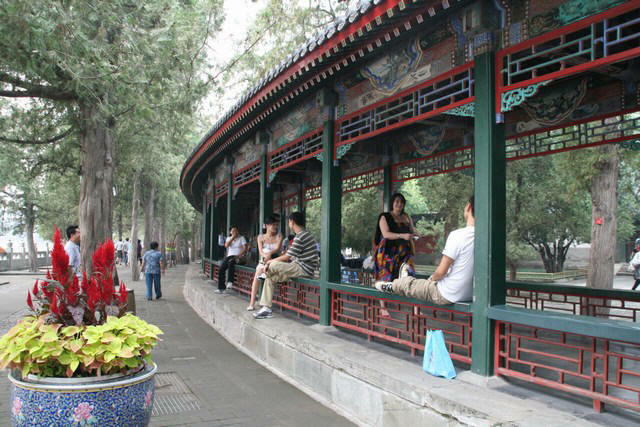 The classical Chinese garden must be view-able, tour-able and livable, all at the same time; which means, that all scenic spots and areas must be connected by paths for walking convenience. In order to create constantly changing scenes along the way, twisted paths are suitable. Straight roads are forbidden, for obvious reasons. Open air paths coexist with corridor paths, that shield one from the sun and rain. Some paths are built along walls, some twist and turn, some move up and down over slopes and hills, while still others hover above water via covered bridges. Along these winding paths and corridors, the builder sets up a variety of scenes, a hall, a pavilion, a water pavilion, an ancient tree, or a cluster of bamboos. 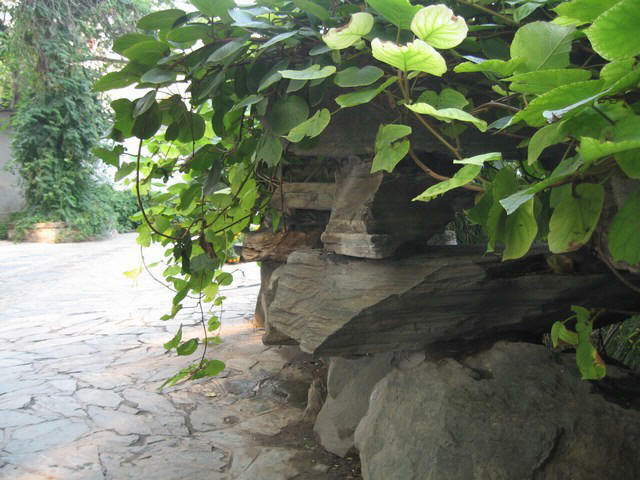 Even a pile of rocks, when placed strategically on a hilltop, by the pond, or at the end of a road, can add to the beauty, when reasonably and cleverly positioned. In order to expand the touring area in a limited space, private gardens are often segmented into different scenic areas by corridors and walls. These walls are not high, and often incorporate doorways or see-through windows, so that the walls divide but do not totally separate. These corridors and walls add to the scenery, but they also divide and connect the scenic areas themselves. In a larger garden, the garden builder must design at least one special route for touring. Starting at the entrance, one strolls along stone paths or the bank of the pond, or enters a doorway, or climbs a mountain path, or enters a hall, or takes a short rest in a water pavilion. Each move from one area to the next opens up a new vista, thereby enhancing the visitor's experience and enjoyment of the garden. 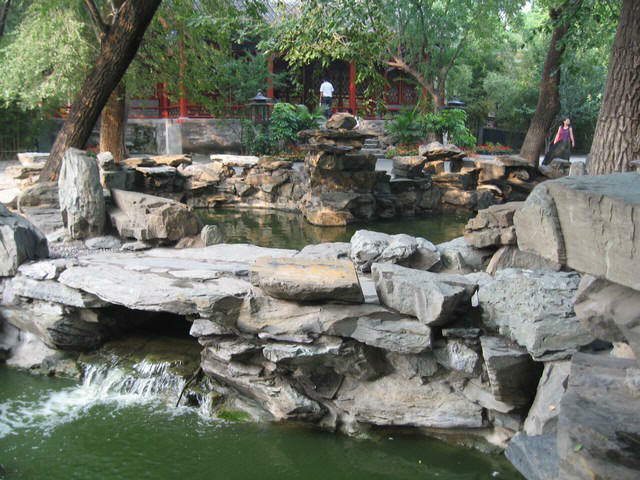 The ancient Chinese gardens and parks of were framed by real mountains and natural waterways. Since circumstances, and space, do not always allow such extravagance, the practice of simulating natural mountains and waterways came into being. 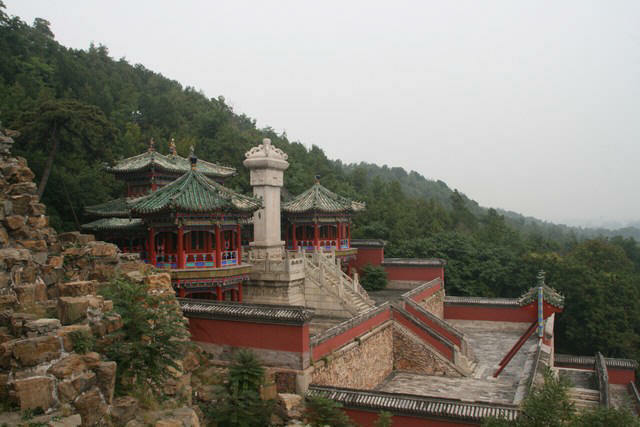 In the Song Dynasty, an imperial garden called Gen Yue was built in the eastern capital of Bianliang. The Huizong Emperor (period of reign 1101-1125) demanded that the magnificence of the Five Mounts in China be represented, along with the precipitous Sichuan mountain paths. This endeavor took the craft of creating artificial mountains and waters to its peak. 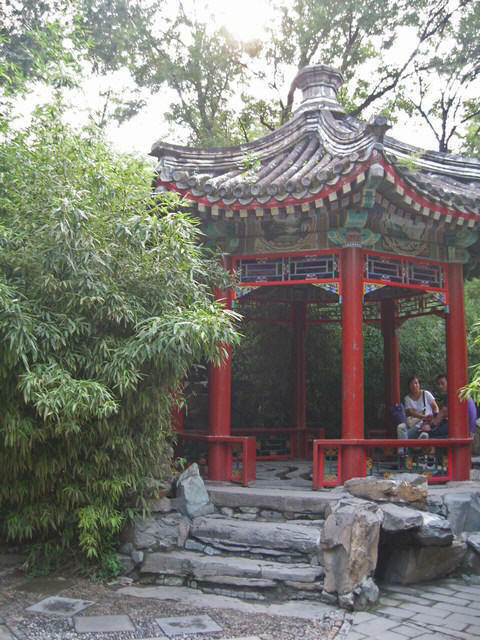 By the Ming and Qing Dynasties, imitating nature had already become an important craft in private garden construction. In order to create the desired effect one must know some of the basic rules of mountain building in gardens. One need to consider whether the environment is to be open and spacious, or deep and quiet. This is determined by the number, size, and arrangement in height of the peaks. The color, amount, and disposition, of earth, and stone, are also important. For example, yellow stones create a natural and majestic effect. Mountains of earth should be covered with flowers and plants to create a l;ush appearance, and stones should be scattered among the earth as if they appear out of the ground. In a word, artificial mountains should appear to be natural. ‘We were the First tea-party at the Summer Palace, the others have been given at the Empress’s winter home within the city, and during the drive I began to get the feeling that those responsible for making the arrangements for us had been rather carefree about this. Our route led through an area in which bandits and still roaming bands of Boxers are reported from time to time and I could not really feel that our elderly escorts, with their slung rifles, would be much use if we ran into one of these, I did not, of course, say anything to the others about this, but I think Edith Harding was having similar thoughts, and from time to time she kept pressing against her lips a handkerchief heavily scented with eau de Cologne. However, we arrived safely, driving through what looked rather like a triumphal arch, not part of any wall, just standing by itself, this set beyond a vast lake quite choked with lotus plants, though no blooms. As we got down from the carriage what I noticed at once was the perfect symmetry of the scene ahead, first a white marble bridge, gently arching, then marble steps to another gate, its tiles of Imperial yellow, then the roof of a second gate beyond this appearing over the first. Towing above all, on a hill, was a five-story pagoda on a broad stone base, this flanked by two little pavilions on their own mounds, perfectly matched and looking rather like fantastical summerhouses. Everything was matched in this way, the trees flanking the approach to the marble bridge pines of exactly the same size and shape. The sun was shining and everywhere was colour, not from flower beds, but from roofs and columns, a wild gaiety that still remained dignified because of the balance of everything. Pritzker Architecture Prize for Mr. Wang Shu. The Chinese architect Wang Shu, whose buildings in a rapidly developing China honor the past with salvaged materials even as they experiment with modern forms, has been awarded the 2012 Pritzker Architecture Prize. Mr. Wang is the first Chinese citizen to win the prize (I. M. Pei, an American, was the first Chinese-born architect to win, in 1983). The selection of Mr. Wang, 48), is an acknowledgment of “the role that China will play in the development of architectural ideals,” said Thomas J. Pritzker, chairman of the Hyatt Foundation, which sponsors the prize. 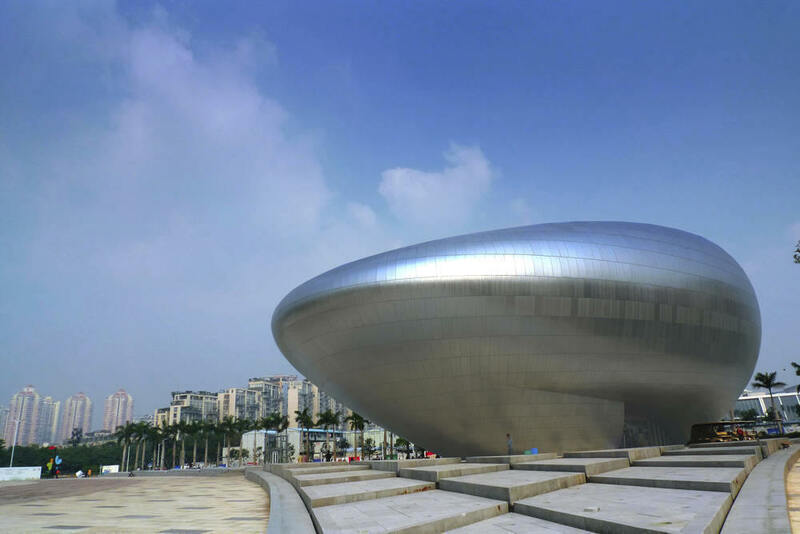 Mr. Wang’s major projects, all in China, include two in Ningbo, a coastal city south of Shanghai: the Ningbo Contemporary Art Museum, completed in 2005, and the Ningbo Historic Museum, completed in 2008. With the history museum, a commission Mr. Wang won in 2004 after an international competition, he sought to evoke what life used to be like in this harbor city. In designing the Xiangshan Campus of the China Academy of Art in his native Hangzhou, Mr. Wang also reused materials, covering the campus buildings with more than two million tiles from demolished traditional houses. His first job was researching the old buildings at Zhejiang Academy of Fine Arts in Hangzhou as it underwent a renovation. His first architectural project — a youth center for the small town of Haining, also in Zhejiang Province, near Hangzhou — was completed in 1990. In 1997, after a decade of working with various craftsmen to gain building experience, Mr. Wang and his wife, Lu Wenyu, founded their own practice in Hangzhou, called Amateur Architecture Studio. Mr. Wang has likened architecture to creating a Chinese garden: it requires the ability to be flexible, to improvise and to solve unexpected problems. He brought this sensibility to his breakout project, the Library of Wenzheng College at Suzhou University, which was completed in 2000 and received the Architecture Art Award of China in 2004. Honoring both the environment and traditions of Suzhou, a city famous for its gardens, he was careful to make his work as unobtrusive as possible: nearly half the building is underground. This museum is created especially for events like fashion shows, product design and conceptual automotive events. The inspiration for the project comes from both the location being close to the bay and from the needs of this program. The goal was to create a space that is surreal to the subject matter, but also transcendental in surrounding and feeling. The result is an entirely white painted space, a surreal borderless space, that seems to go on into the infinite. The museum in Shenzhen has small triangular windows scattered randomly, resembling flying birds passing by. The first floor of the building holds the entry lobby and café, while the second and third is mainly exhibition space. Storage space is spread out evenly through the floors, with movable walls allowing the exhibition spaces to be very flexible in scale and function. Set into its landscape, the building’s form seems to float above the ground, as if it was not from this planet.